A critical factor in the bass response of a speaker in a room is the distance of nearby walls (or boundaries) from the speaker. The wall behind the speaker reflects the omnidirectional low frequency sound energy back towards the listening position. When the total distance travelled by this reflected sound is half a wavelength it destructively interferes with the direct sound causing a notch to appear in the bass region of the sapeaker. This notch will be typically about 2/3rd octave wide and cause a significant decrease of the total bass energy in the room. You must check that the speaker is not at a distance from the wall behind it that will cause this cancellation notch to appear in the frequency range that the speaker can reproduce. For example, if a speaker is placed so that the front of it is 86cm from the wall behind it the cancellation frequency will be approximately 100Hz. The speaker should be moved as close to the wall behind it as possible so that cancellation frequency is very high. At these higher frequencies the speaker has far less omni-directional energy so the cancellation effects are greatly reduced. One side effect of this method is that the bass tilt should be set correctly to compensate for the additional loading presented to the bass driver by the wall. One final tweak to minimise any remaining cancellation effect is to pack any remaining space between the speaker and the wall with absorbing material such as rock wool. 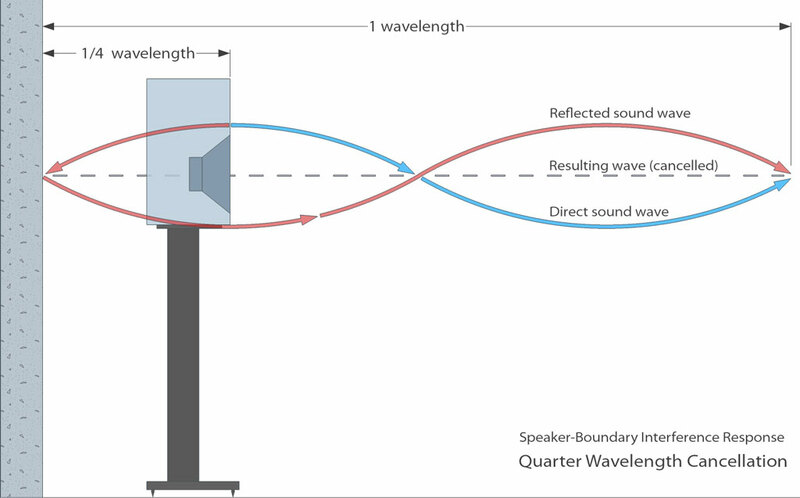 The speaker should be moved further away from the wall behind it so that the cancellation frequency is well below the low cut off frequency of the speaker. In practice this is not always possible, as the room may not be large enough especially for speakers with a deep low cut-off frequency. Other sources of bass cancellation are from reflections off the floor, ceiling, side walls and rear wall. The cancellation is still based on half wavelength cancellation of the path difference but, as the sound does not travel back on itself, a slightly different formula is required. In fact this is the general equation for cancellation frequencies and can also be use for desk reflections that occur in the mid frequency range. Change the room shape so that the reflections are not directed towards the listening position. This is not always possible for physical and financial reasons. Ensure that the wall behind the listening position (rear wall) is more that 3m away from the listening position to avoid low frequency cancellation problems. This is often a problem in rooms that are less than 5m in length. Add absorbing materials to reduce the level of the reflected sound. Although generally a cheaper solution this has the disadvantage that the reverberation time, T60, can be adversely affected.